If you have diabetic neuropathy, you are at increased risk for developing other types of neuropathies, such as carpal tunnel syndrome . Diabetic neuropathy can lead to serious complications, including foot ulcers , infection, and limb loss. You will be asked about your symptoms and medical history. A physical exam will be done. A foot exam will also be done. Images may be taken of your bodily structures. This can be done with an ultrasound . Your nerves may need to be tested. This can be done with a biopsy . It is important to regularly monitor blood glucose levels. Meal planning, exercise, and/or medications can help. Footcare will be needed to avoid ulcers . 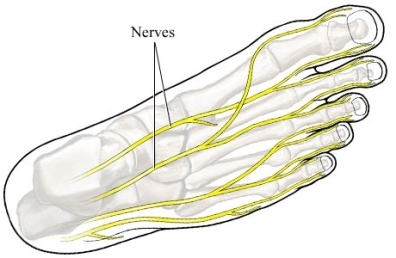 The nerves in the feet are the ones most often affected by neuropathy. This care will involve regular visits to a foot doctor and careful cleaning, inspection, moisturizing, and grooming of the feet. In addition, always wear well-fitting shoes and thick, soft, seamless socks to help protect your feet from injuries. Nerve decompression surgery may be done to reduce pain. Other treatments will depend on symptoms. Medications can be used to relieve pain, burning, tingling, or numbness from peripheral neuropathy . Often, the medications used to treat these symptoms are the same ones used to treat seizures and depression . Another option to treat pain is called transcutaneous electrical nerve stimulation (TENS). With TENS, a machine sends painless electrical signals through the skin to the nerves. Diabetic neuropathies: the nerve damage of diabetes. National Institute of Diabetes and Digestive and Kidney Diseases website. Available at: http://www.niddk.nih.gov/health-information/health-topics/Diabetes/diabetic-neuropathies-nerve-damage-diabetes/Pages/diabetic-neuropathies-nerve-damage.aspx. Updated November 2013. Accessed September 19, 2017. Diabetic peripheral neuropathy. EBSCO DynaMed Plus website. Available at: http://www.dynamed.com/topics/dmp~AN~T115259/Diabetic-peripheral-neuropathy . Updated July 27, 2017. Accessed August 24, 2017. Izenberg A, Perkins BA, Bril V. Diabetic neuropathies. Semin Neurol. 2015 Aug;35(4):424-30. Russell J, Zilliox L. Diabetic neuropathies. Continuum (Minneap Minn). 2014 Oct;20(5 Peripheral Nervous System Disorders):1226-40. Types of peripheral neuropathy: pre-diabetic/diabetic University of Chicago Center for Peripheral Neuropathy website. Available at: http://peripheralneuropathycenter.uchicago.edu/learnaboutpn/typesofpn/diabetes/diabetes.shtml. Updated May 16, 2010. Accessed September 19, 2017. 2/4/2010 DynaMed Plus Systematic Literature Surveillance http://www.dynamed.com/topics/dmp~AN~T115259/Diabetic-peripheral-neuropathy: Dubinsky RM, Miyasaki J. Assessment: efficacy of transcutaneous electric nerve stimulation in the treatment of pain in neurologic disorders (an evidence-based review): report of the Therapeutics and Technology Assessment Subcommittee of the American Academy of Neurology. Neurology. 2010;74(2):173-176. 6/16/2015 DynaMed Plus Systematic Literature Surveillance http://www.dynamed.com/topics/dmp~AN~T115259/Diabetic-peripheral-neuropathy: Macaré van Maurik JF, Oomen RT, et al. The effect of lower extremity nerve decompression on health-related quality of life and perception of pain in patients with painful diabetic polyneuropathy: a prospective randomized trial. Diabet Med. 2015;32(6):803-809.